The great duty of spreading the Christian name was entrusted in a special way to Peter, the head of the apostles, and to his successors. It urges the popes to send messengers of the Gospel to the various peoples of the earth, as the affairs of the merciful God demand. For this reason they sent Augustine to the Britons, Patrick to the Irish, Boniface to the Germans, and Willebrord to the Flemish, Dutch, and Belgians. Often they sent other men to other peoples to care for their souls. So in the exercise of their apostolic duty, they commissioned the holy men Cyril and Methodius to go to the Slavic people. Through their presence and more especially through their labors, those people have seen the light of the Gospel and have been led from their barbarian ways to a humane and civilized culture. 2. All Slovenia has continued to celebrate the work of Cyril and Methodius, well-known peers of the apostles, and the Roman Church has honored both of them with just as much fervor. The Church honored both of them in many ways while they lived, and in death it did not want to be without the remains of one of them. The Bohemians, Moravians, and Croatians were accustomed to celebrating religious feasts annually on March 9. Since 1863 Pius IX granted them permission to hold their feasts on July 5 and to discharge due prayers in memory of Cyril and Methodius. Not long after that, when the great council was held at the Vatican, many bishops humbly requested from this Apostolic See that their cult and appointed feast be extended to the whole Church. Until now the matter has been under study. But because of the change in the status of the government in those areas over the years, it seems like an excellent opportunity to help the people of Slovenia, whose well-being and salvation greatly concern Us. Therefore, We shall not allow Our paternal love to fail. We wish to promote and increase the devotion to these most holy men who once spread the Catholic faith and recalled the Slavic people from ruin to salvation. They now serve as our heavenly advocates and will powerfully defend us. Moreover, in order to bring out more fully what kind of men We propose for the veneration and worship of the Catholic world, We wish to give a brief history of their deeds. 3. 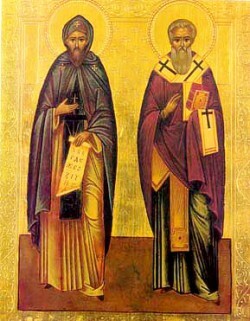 The brothers Cyril and Methodius, born in Thessalonica, went as boys to Constantinople in order to study the humanities in the chief city of the East. The spark of genius already discerned in these young men soon became apparent. They both advanced quickly, especially Cyril, who became so distinguished in learning that he won for himself the title of “The Philosopher.” Soon after this, Methodius undertook the monastic life. Under the influence of the Patriarch Ignatius, the Empress Theodora commissioned Cyril to teach the Christian faith to the Khazer tribes who dwelt beyond the Chersonese. These people had asked that suitable priests might be sent to them from Constantinople. Cyril accepted the mission willingly and departed for Tauric Chersonese so that, as some relate, he could study the language of the people. It was at this time that he had the good fortune to discover the remains of Pope Clement I. This courageous martyr was thrown into the sea by order of the Emperor Trajan and was afterwards buried with the anchor to which he had been fastened. The anchor, together with the ancient tradition, made it very easy to identify the remains. With this priceless treasure, Cyril went into the towns and homes of the Khazars. In a short time, after abolishing many superstitions, he won for Jesus Christ these people, who were taught by his word and moved by the spirit of God. To the new Christian community Cyril gave an example of self control and charity by refusing all the gifts offered to him by the inhabitants, except the slaves whose liberty he restored to them when they embraced Christianity. He soon returned to Constantinople to enter the monastery of Polychronius, which Methodius had entered. 4. Meanwhile, reports of the great events happening among the Khazars reached Rastislav, Prince of Moravia. Aroused by their example, he negotiated with the Emperor Michael III for an evangelizing mission to be sent from Constantinople, and his wish was granted. Thus, the great worth of Cyril and Methodius as seen in their previous accomplishments, together with their zeal for helping their neighbors, caused their selection for the Moravian mission. 5. As they began their journey through Bulgaria, which had already been converted to Christianity, they let pass no opportunity for increasing the faith. Upon reaching Moravia, they were met by a large crowd who had come with great desire and joy to greet them. Without delay the apostles strove to penetrate their minds with the doctrines of Christianity and to raise their hopes to heavenly things. They did this with so much force and with such energetic zeal that in a very short rime the Moravian people gave themselves to Jesus Christ. 6. Much of their success was due to Cyril’s knowledge of the Slavic language, which he had acquired earlier. The influence of the Old and New Testaments as translated by him into the vernacular was also considerable. The whole Slavic people owe much to the man who gave them the Christian faith and with it the advantages of civilization. Cyril and Methodius were also the inventors of the alphabet which afforded the Slavic tongue the means for a written language, and they are even looked upon as having formed the language. 7. Another report from these remote provinces announced to Dome the glory of their deeds. And so, when Pope Nicholas I ordered the brothers to Rome, they obeyed without hesitation. They began their Roman journey quickly, bringing with them the remains of St. Clement. At this news Adrian II, who was elected to replace the late Pope Nicholas, went out with the clergy and the people to greet the illustrious visitors. The body of St. Clement was brought with great portents into the basilica constructed at the time of Constantine, in the very tracks of the ancestral home of that invincible martyr. 8. Cyril and Methodius then recounted to the Supreme Pontiff and his clergy the apostolic mission they had fulfilled with so much holiness and labor. They were accused of acting in opposition to ancient customs and contrary to holy rites in making use of the Slavic language for religious matters. However, they pleaded their cause with such indisputable and noble reasoning that the pope and all the clergy praised them and approved their course of action. Both then took an oath in the Catholic manner and swore that they would remain in the faith of St. Peter and of the popes. After that they were created bishops and consecrated by Adrian himself, and many of their disciples were raised to different grades in Holy Orders. 9. However, it was divine foresight that Cyril should die on February 14, 869, more mature in virtue than in age. After a splendid public funeral like that given to popes, he was buried with honors in a tomb which Adrian had built for himself. Because the Roman people could not bear to send the holy corpse to Constantinople though his grieving parent asked for it, it was brought to the basilica of St. Clement and buried near him whom Cyril had held in reverence for so many years. As he was taken through the city among festal songs and psalms – not so much in the manner of a funeral as that of a triumph – the Roman people made offerings of heavenly honor to the holy man. 10. After these things had taken place, Methodius returned under Papal orders to Moravia as bishop. In that province, having become a spiritual model for his flock, he began to serve Catholicism more keenly every day. He strongly resisted the factions of reform, lest the Catholic name fall through unsound thinking. He educated prince Svatopluk, who succeeded Rastislav in religious matters. He warned him about shirking his duties, rebuked him, and finally excommunicated him. For these reasons he incurred the anger of that revolting and wicked tyrant; then he was sent into exile. He was recalled a short time later, and his efforts produced a change of heart in the prince and an understanding that he should return to a new purity of life. 11. It is remarkable that Methodius’ vigilant love had crossed the borders of Moravia and reached the Liburnians and Serbs, since he was Cyril’s successor. Now it reached the Pannonians, whose prince, Kocel, he disposed to the Catholic religion and retained in his duties. It also reached the Bulgarians, whom he confirmed in the faith along with their leader Boris. Then he dispensed the gifts of heaven to the Dalmatians. Finally, he worked strenuously that the Carinthians might be brought to the knowledge and the worship of the one true God. 12. But this became a source of trial to Methodius. Some members of the new Christian community became jealous of his accomplishments and virtue. They accused him, to Pope John VIII, Adrian’s successor, of being unsound in faith, though he was innocent. They also accused him of violating the traditions of the Fathers who used only the Latin or Greek languages in discharging their religious duties. Wanting to preserve the integrity of the faith and to maintain the ancient traditions, the pope then summoned Methodius to Rome to justify himself. Methodius appeared before Pope John, several bishops, and the Roman clergy in 880, for he was ever ready to obey and confident in the testimony of his conscience. He obtained an easy victory by proving that he had followed Catholic teachings himself. He showed that he had always taught others the faith which he had sworn on the tomb of St. Peter, the prince of the Apostles, an oath given in the presence of Adrian and with his approval. If he had used the Slavic language in the celebration of the sacraments, he had done so for good reasons, since he had the special permission of Pope Adrian himself and the Holy Scriptures did not forbid it. Methodius freed himself so completely from every suspicion of guilt that the pope embraced him then and there and confirmed his archiepiscopal jurisdiction and his mission to the Slavs. Methodius returned to Moravia in the company of several bishops who were to be his coadjutors, with letters of recommendation and freedom of action in his work. 13. To confirm those things, the pope sent letters to Methodius so that he would not again become subject to the envy of his detractors. For this reason, Methodius performed his assigned duties more vigilantly, confident that he was joined to the pope and to the whole Roman church in a close bond of faith and love. His labor soon produced an exceptional harvest. With the assistance of a priest, he converted prince Boriwoj of Bohemia, then his wife Ludmilla, and before long Christianity spread throughout that land. At the same time he brought the light of the Gospel to Poland; he penetrated Galicia, where he established the episcopal see of Lwdw. Then, as some report, he penetrated into Muscovy and established the episcopal See of Kiev. 14. Having crowned himself with imperishable laurels, he returned to Moravia and his own people. He felt his death approaching and named his successor, and his last words exhorted the clergy and people to practice virtue. He departed in peace from this life, which had been the path to heaven for him. As Rome mourned Cyril, so Moravia mourned the loss of Methodius, showing its grief by giving his burial every honor. 15. Venerable brothers, the memory of these events causes Us great joy. We are deeply moved by the magnificent association of the Slavic nation and the Roman church, an association with the noblest beginnings. Though these two apostles of the Christian faith went from Constantinople to preach to people in foreign lands, it was from this Apostolic See, the center of Catholic unity, that they received the investiture of their mission or, as happened more than once, its solemn approbation. Truly it was here in this city of Rome that they rendered an account of their mission and answered their accusers. It was here at the tombs of Peter and Paul that they swore to keep the Catholic faith. It was here that they received episcopal consecration and the power to establish the sacred hierarchy, while observing in it the distinction of each order. Finally, it was here that they sought and obtained permission to use the Slavic language in holy rites. This year, ten centuries will have passed since Pope John VIII wrote to prince Svatopluk of Moravia: “It is right that we praise the Slavic language, which re-echoes with the praises due to God. We ordain that the proclamations and works of our Lord Jesus Christ should be said in that language. Nothing in true faith, or doctrine forbids us to sing the Mass in the Slavic language, or to read the Gospel lessons (correctly translated and interpreted) in it, or to chant in it the Divine Hours.” After many changes, Pope Benedict XIV sanctioned this custom in an apostolic letter dated August 25, 1754. Whenever the rulers of the peoples evangelized by Cyril and Methodius asked them, the popes gave generously of their humanity in teaching, kindness in giving advice, and singular good will wherever possible. Above all, Rastislav, Svatopluk, Kocel, Saint Ludmilla, and Boris have experienced the remarkable love of Our predecessors. 16. The paternal concern of the popes for the Slavic people did not stop with the death of Cyril and Methodius. Rather, it has always shone forth in preserving among them the holiness of religion and public prosperity. In fact, Nicholas I sent priests from Rome to the Bulgarians to educate the people, and he also sent the bishops of Populonia and Ostia to govern the new Christian community. He gave a loving response in the frequent controversies of the Bulgarians concerning holy law. In this matter, even those who do not favor the Roman Church praise and admire its prudence. After this calamitous disagreement, We must praise Innocent III for reconciling the Bulgarians with the Catholic Church, and We must praise Gregory IX, Innocent IV, Nicholas IV, and Eugene IV for preserving them in reconciled grace. Similarly the love of Our predecessors shines forth in their contacts with the Bosnians and Erzevovinenses, who were deceived by evil opinions. We make special note of Innocent III and Innocent IV, who eradicated this spiritual error, and of Gregory IX, Clement VI, and Pius II who were eager to establish firmly the levels of sacred authority in those areas. Innocent III, Nicholas IV, Benedict XI, and Clement V conferred neither the last nor the least of their cares on the Serbs, who cunningly prepared deceptions to harm religion, deceptions which the popes prudently contained. The Dalmatians and the Liburnians received singular favor because of the constancy of their faith and their changing duties. John X, Gregory VII, Gregory IX, and Urban IV held them up as examples for all. Finally, there are many evidences of the good will of Gregory IX and Clement XIV toward the church of Sirmium, which was destroyed in the sixth century by barbarians and later rebuilt through the care of St. Stephen I, king of Hungary. 17. For this reason, We thank God for giving Us this suitable occasion to thank the Slavic people and to effect a common benefit for them. Indeed We do this no less eagerly than Our predecessors. Certainly We foresee and desire that the Slavic nation should learn from the great abundance of bishops and priests. May they be strengthened in the profession of the true faith, in true obedience to the Church of Jesus Christ. May they understand more each day how great a force of good comes from the customs of the Catholic Church in family life and in all the orders of government. Certainly those churches vindicate the many great cares We showed toward them. There is nothing We desire more than to take the appropriate measures for their comfort and prosperity and to have all their relations with Us be in perpetual harmony. This is the greatest and the best bond of safety. It remains that God, who is rich in mercy, might look upon Our plans and favor what We have begun. Meanwhile, We have Cyril and Methodius, the teachers of Slovenia, as intercessors with Him. As We wish to promote their veneration, so We trust in their future heavenly patronage. 18. Therefore, We decree that July 5 be set aside in the calendar of the universal Roman Church, as Pius IX ordained. On this day the feast of Sts. Cyril and Methodius shall be celebrated annually with the office and mass proper to a double minor rite, as approved by the holy council. 19. And We entrust to all of you, venerable brothers, the publication of this letter. Order every priest who celebrates the divine office according to the rites of the Roman Church to observe everything that is prescribed in this letter in each church, province, city, diocese, and monastery. We persuade and encourage you to stimulate prayer to Cyril and Methodius, so that they might intercede with God and watch over Christianity in the East. May there be constancy in all Catholic men and the will to reconcile all dissidents to the true Church. 20. We order this to be established and fixed as written above, notwithstanding the constitutions of Pope St. Pius V and other apostolic documents on the reform of the breviary and the Roman Missal, or other statutes and customs – even very old ones – or anything else to the contrary. 21. As a pledge of Our good wishes and of divine favor, venerable brothers, We lovingly impart Our apostolic blessing to each one of you, to all the clergy, and to each and every person committed to your care. Given in Rome, at St. Peter’s, on September 30, 1880, in the third year of Our Pontificate.